It’s been over 2 months since the last photoshop tutorial I had posted, but I have great news for you — I am back online with loads of new stuff to show you, so stay tune for all our upcoming tuts! Today, we will begin with this nice and beautiful text effect, and as most readers request, we also release the psd for download, for only $1. The PSD is for learning purposes only, you can incorporate it in a project for a client, but you cannot directly resell this very file. Enough talking, let’s get started. Step 1. Preparing the Photoshop Canvas. Create a new Photoshop file (Ctrl + N). We are using 600*400 size here but as always — yours could be a lot bigger if you need. Using the Paint Bucket tool, fill the canvas with grey-blue dark color — #535559. Step 2. Choosing the font. I am personally a big fan of all the fonts that were used and popular back in the 50’s, so my all time favorite font will probably be “Bello”. it’s not free, but you can purchase it online. Please note that if you purchase the PSD file, the font will NOT be included, as we cannot distribute commercial fonts. So, if you have Bello font, select it and type your word in big letter, we used 188pt here. Step 3. Adding Layer Styles. Now the background texture. We will be using a pattern which we created ourselves, and if you purchase the psd file it will be included already in the style itself. Lastly, we will add a 1px stroke, with gradient overlay, to give the text more depth. This is what we have got so far, with all the layer styles applied correctly. If your result differs from what you see here, go back and check if all the settings for layer styles have been applied correctly, so far it’s only the technical part, so you should not have any problem. Step 4. Adding Depth to the Canvas. Press “Ctrl” and click on the text layer in your Photoshop’s layers palette, this will load a selection for text. Create a new layer on top of all the others. Using the gradient tool, from white to transparent, draw a line from the top of the text, to the bottom, this will add mild yet visible gradient to the text. The next and the last step, is to add sweet sparkles all around the text, this will give it more depth, dreamy and elegant feel. Create a new Photoshop layer on top of the rest. Using your Brush Tool, pick the 27pixel brush with soft edge, and using the white color, chaotically spread some dots on the edges of the text. Set the fill opacity of the dots to 70%. Switch from “Normal” to “overlay” mode. TIP: only apply the dots where the the stroke of the text is white, this will enhance the light effect. We also went ahead and added some more glow with different brushes, but be sure not to overdo it, because it’s better to have less gloss and too much of it. I hope you enjoyed this Photoshop tutorial, and be sure to also check our other Photoshop tutorials and subscribe to the feed. If you’d like to learn faster, please feel free to buy the psd file of this tutorial, for only $1.00. When you complete the checkout, remember to click “return to merchant” button — the download will start automatically. If for whatever reason, the download did not redirect you, please leave a comment below or email us, we will send you the file asap. Thank you! Thanks for the detailed explanation. It’s really helpful. Great tut! Thank you very much. 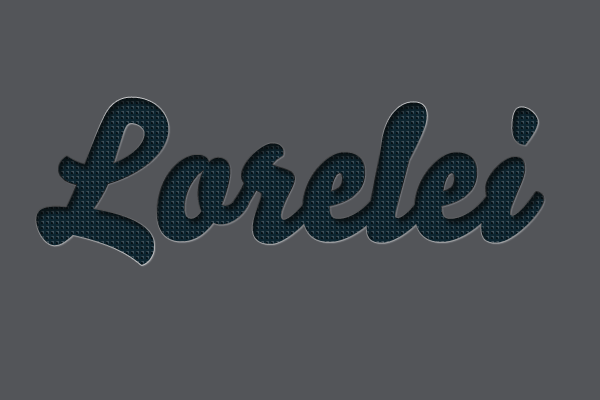 W0W, amazing tutorial, thank you Lorelei! You are GREAT! amazing! possibly the best and most useful tut on this site. I learned so many things in this one. Thanks for this post. The effects used will come in really handy for things like logo design when I’m wanting something to stand out on a page. Very good blog post! I’ve been a lurker on your site for a long time but just wanted to let you know I like your posts. extremely long) so I guess I’ll just sum it up what I wrote and say, I’m thoroughly enjoying your blog. I too am an aspiring blog writer but I’m still new to everything. Do you have any tips for rookie blog writers? I’d genuinely appreciate it. This is really an amazing tutorial for me. I learn a lot from this blog. Many many thanks for sharing with us. It help me a lot..
Amazing I will try it out!!! Many many thanks for sharing with us. Stylish Embossed Text for the detailed explanation. Good and Special Collection. I’m just finding something like that.